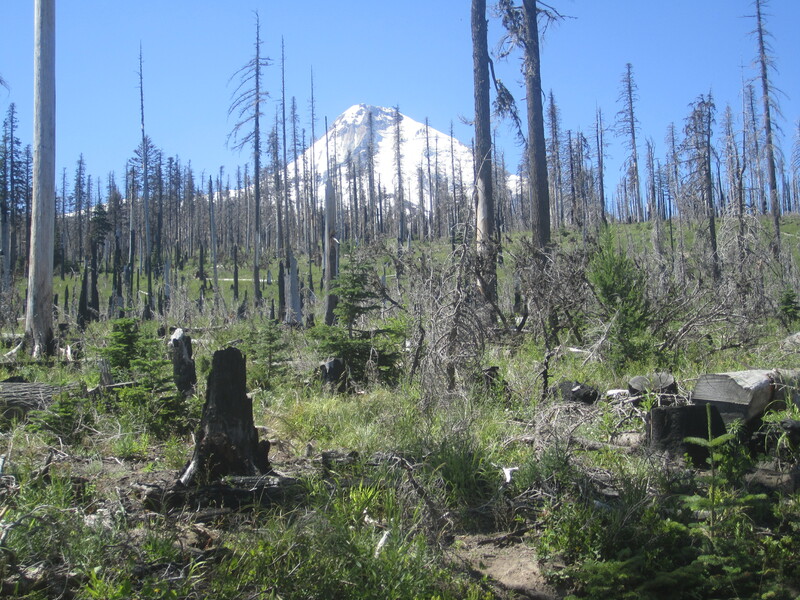 My recent Cooper Spur hike is delayed by business, forgetfulness, and a longer drive than anticipated (partly due to gawking at last year’s wildfire damage). 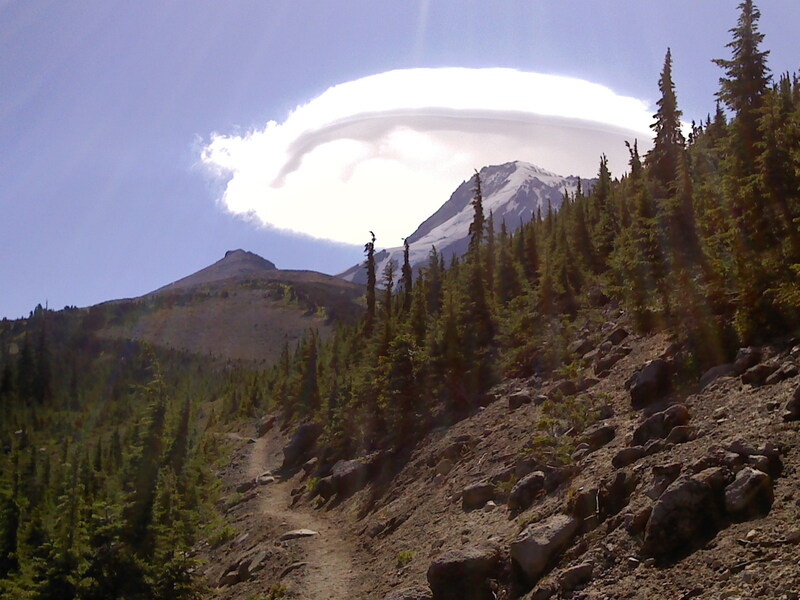 Still, I reach the Cloud Cap trailhead by noon. I have not been here for thirty years, and I want to go see the nearby classic climbing inn, but there is no time. 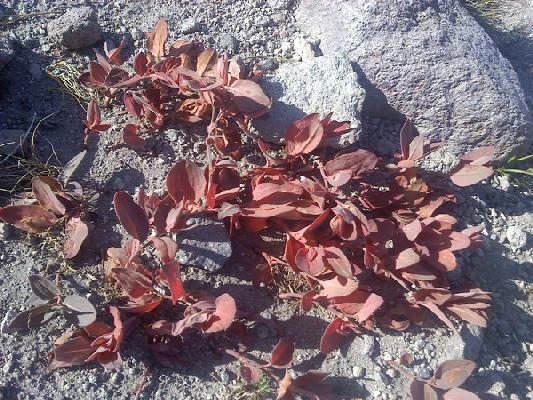 Damage from the Dollar Lake Fire on the road to Cloud Cap. 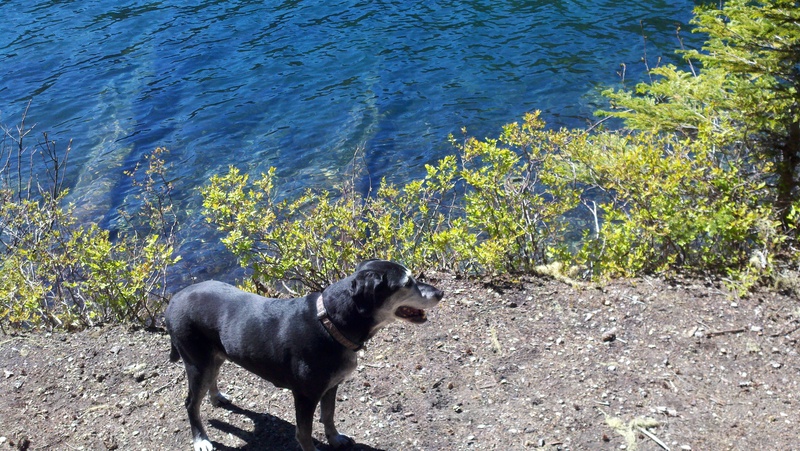 In arranging a parking pass, a wilderness permit, navigation, and a leash for Niko by the campground, my start is slow. 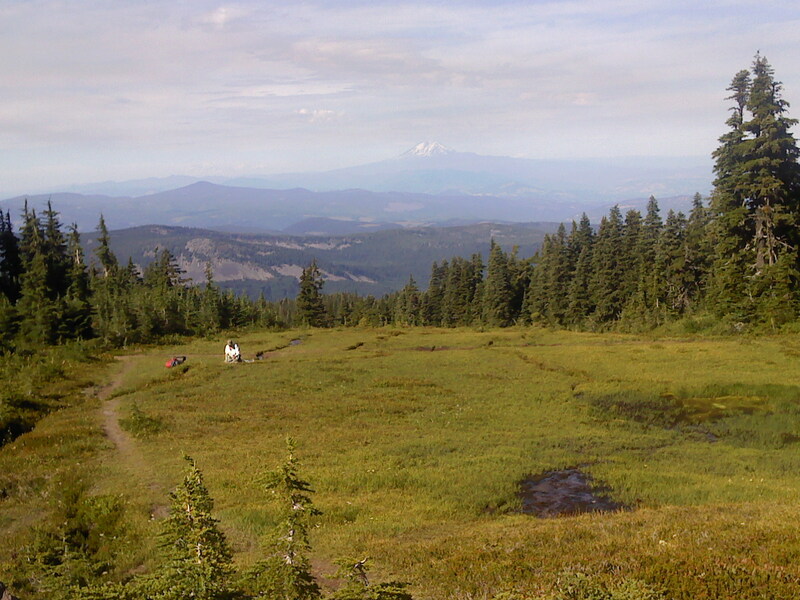 Soon, however, I am walking the Timberline Trail, cruising through alpine meadows. A room with a view in less than thirty minutes. In just over half an hour, I hit the side trail headed more directly up the mountain’s open slopes. Wildflower patches punctuate the grey landscape. After a sidetrip to an old stone shelter built by the CCC in the 1930s, Niko is panting a lot. It is not hot; I wonder if the altitude is affecting him. 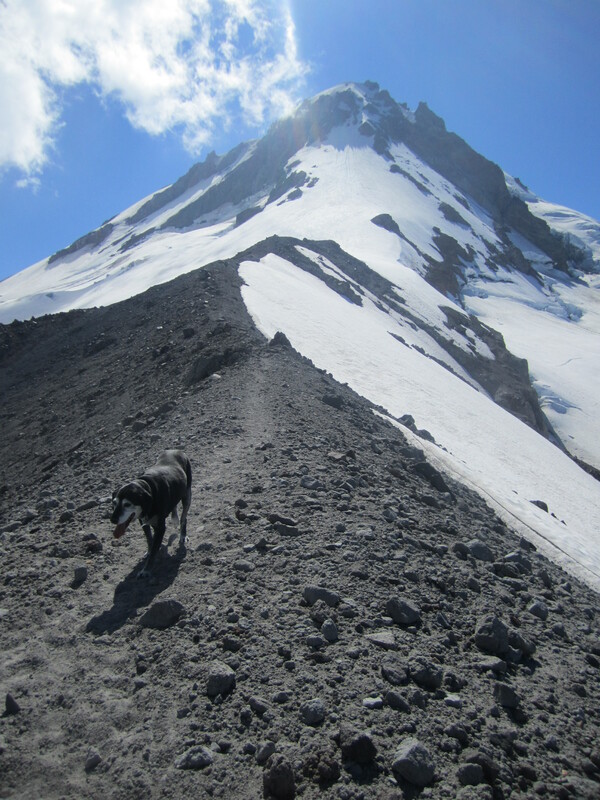 He has been above 6000 feet a few times near Timberline Lodge, but we are already over 7000 feet, and he’s 14 now. We rest in the shade of a tremendous boulder for ten minutes. 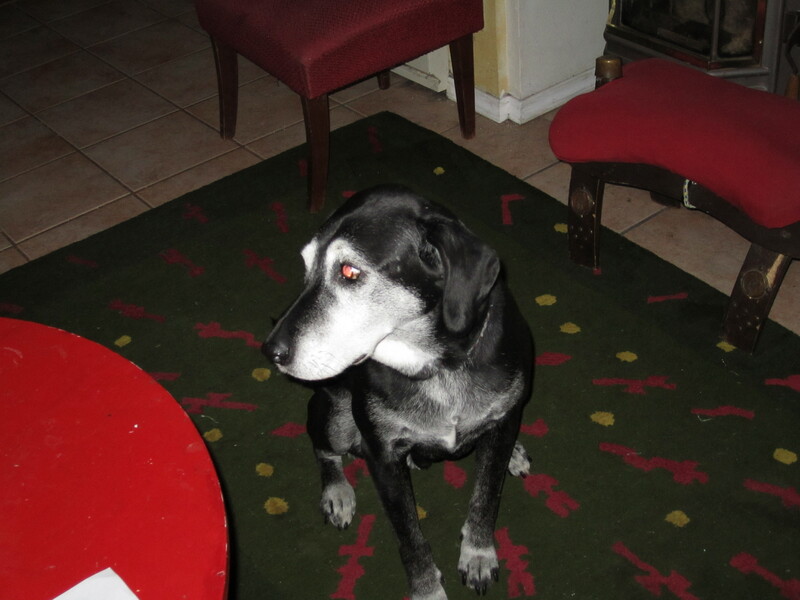 I offer Niko food and water; then we continue. 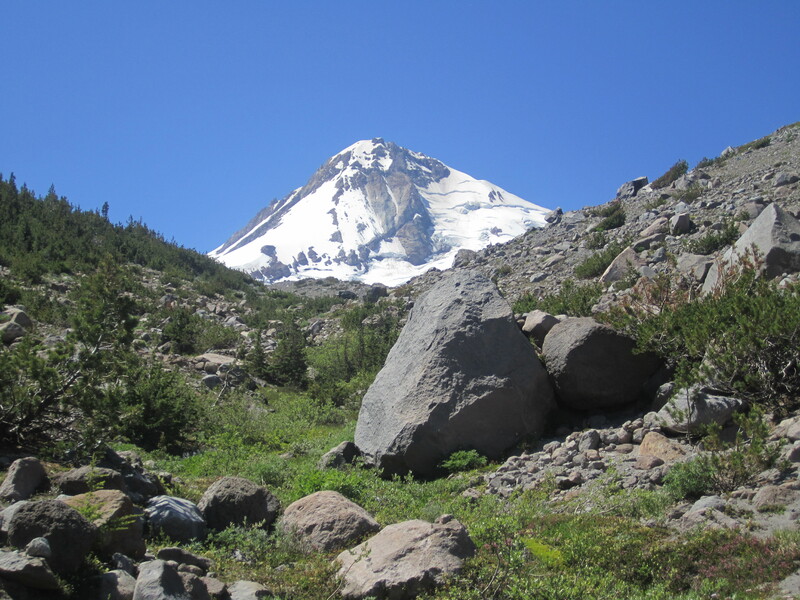 As the trail gains elevation and gets rockier, switchbacks increase, and our pace slows. Two men pass me while I pause at an overlook, but I soon get back in front. My hiking speed is modest, but I take few long breaks. Eventually, the trail becomes a maze of tracks on a scree slope. 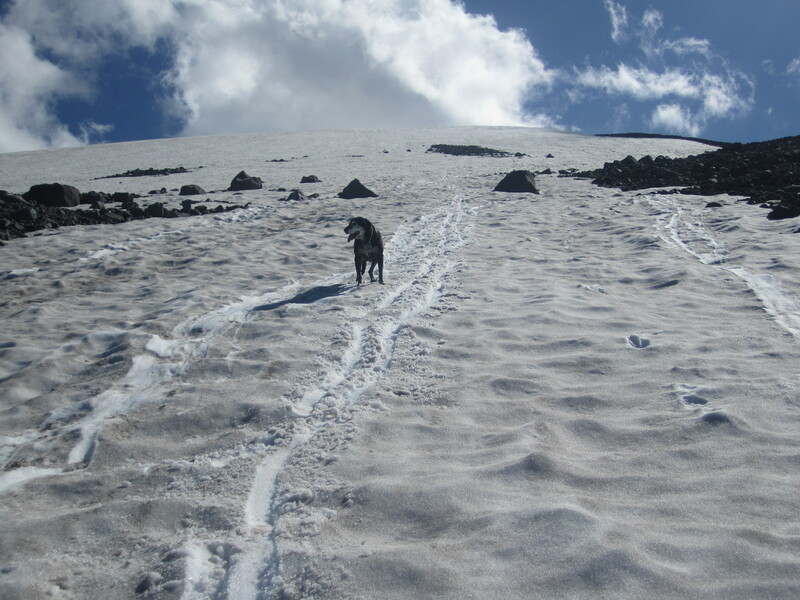 Snow obscures stretches of trail, and there is no soil to erode, so people take shortcuts. It’s hard to worry about the trail; the views are spectacular. Above, Mt. Hood dominates all. To my right and below looms the Eliot Glacier. 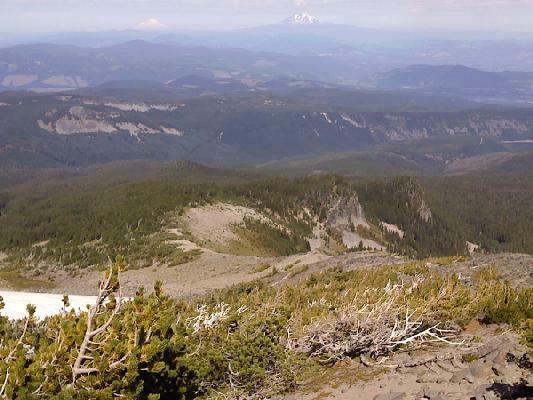 I can also see much of the Badger Creek Wilderness to the southeast, the long flank of Surveyor’s Ridge to the east, and a few of the big Cascade volcanoes, including St. Helens, Rainier, and Adams, dotting the horizon. I crest the ridge in mid-afternoon. Multiple rockpile windbreaks have been carefuly constructed, as though neolithic masons lurk nearby. Niko plops down, panting. I worry about him and rest, taking photos and enjoying the views. I realize I should have put sunscreen on earlier, so I slather it on now. Without shade, the sun is merciless. After five minutes, a man in his thirties catches up to me. We talk about the scenery. 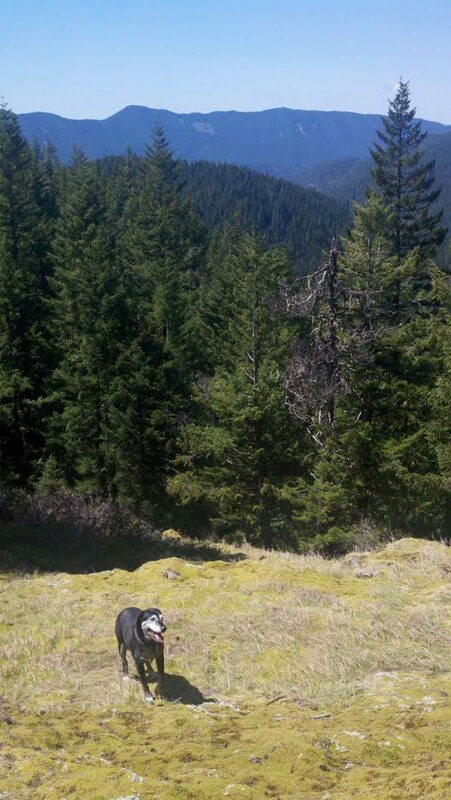 He says it is the best hike he’s ever been on. I can understand the sentiment, but I think I need to ponder a top ten list a bit longer. Time to move on. 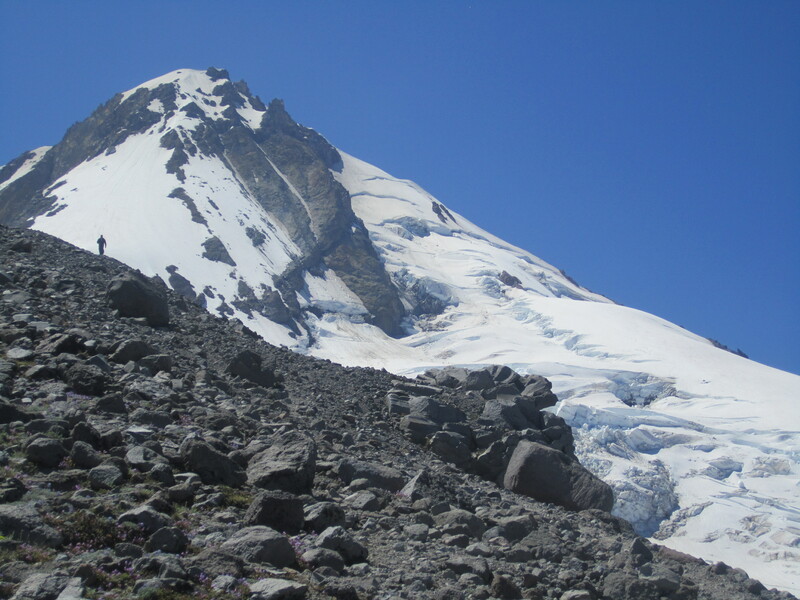 The upper part of Mount Hood, where the mountaineering begins. Much farther than it looks. I give the man an nod and continue uphill toward Tie-In Rock, the last safe spot on the spur, where I see a man descening. 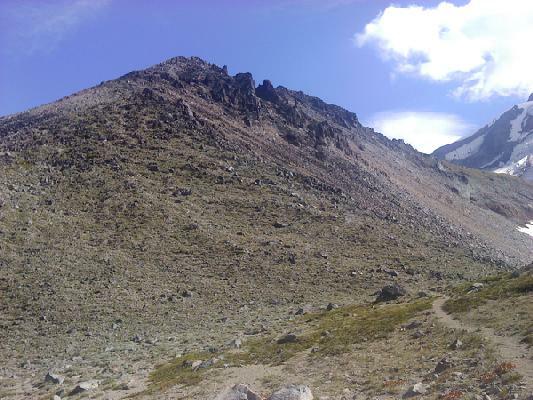 He hikes the last rocky, dusty pitch wearing a beanie and toting a camouflage backback. I note its unusual frame and wonder if it is military issue. We murmur greetings and pass. Later in the week I will read about injured vets getting some deserved rest below at Cloud Cap Inn. (“Air Force Wounded Angels” on http://www.oregonlive.com). Perhaps he is one of them. The view from Tie-In Rock is stupendous. An obvious climbing route splits the rocks above with massive exposure. I am still over 2500 vertical feet below the summit. 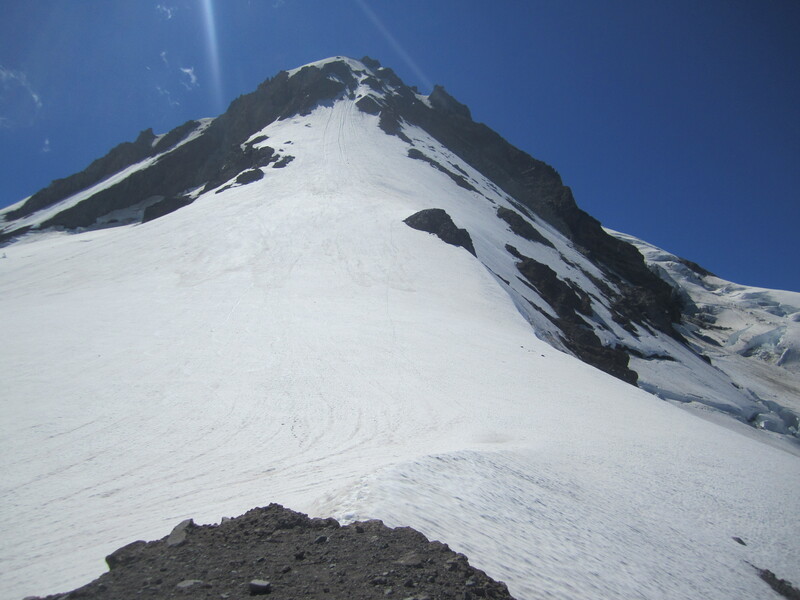 More than a dozen people have died on the Cooper Spur route. Nearby, more technical routes up Eliot Glacier looked tough, and the glacier’s lateral moraines amaze me. 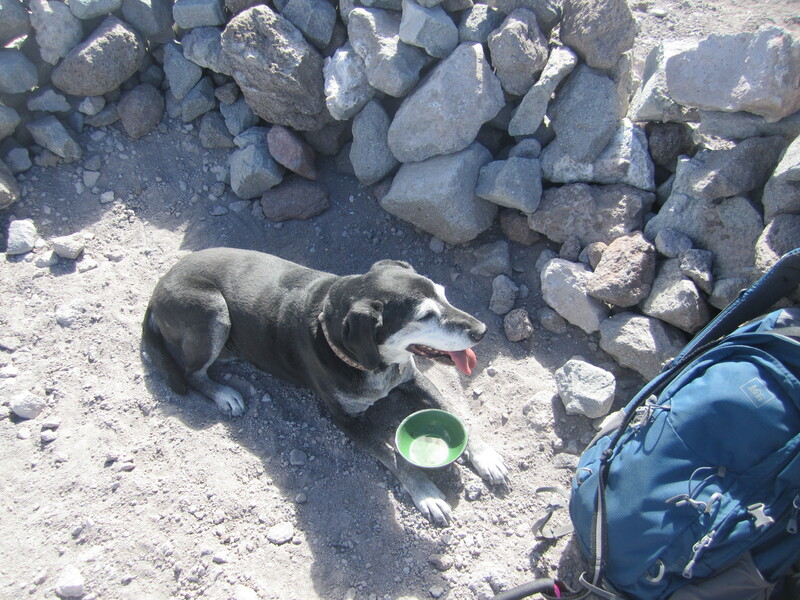 One tired pup at our high point. When Niko seems rested, we head down. Descending, he is tentative on the rocks, and I must coax him a bit through the tricky sections. Just below the first high point I pass two men and diverge from the trail to a long snow slope, where I will half ski, half plunge step on my boots. One of the men jokes that he’d be on his backside quickly. 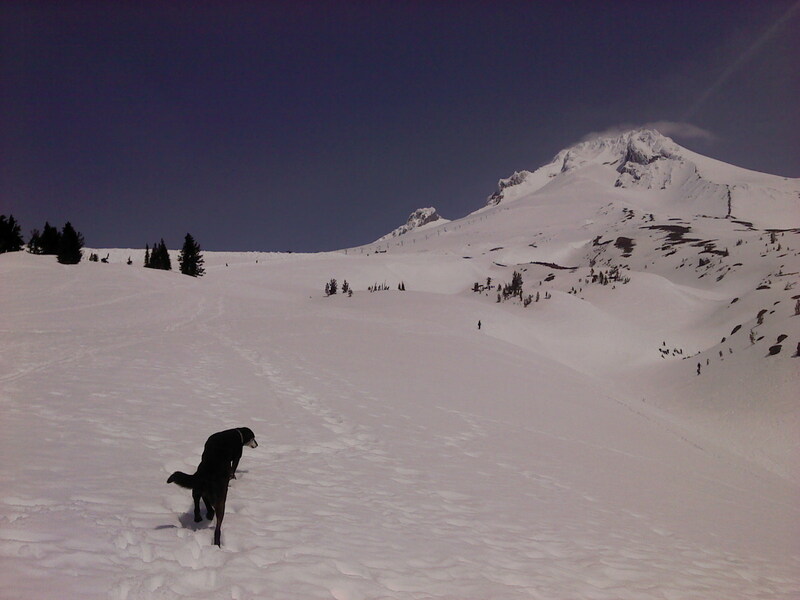 I literally leave them in the dust, heading straight for the Timberline Trail on the snow. When I reach the trail, I look up and see I am at least a quarter mile ahead of the pair. Bootskiing rules. Less than graceful tracks, but they made for a quick descent. Niko just likes the coolness. The final descent becomes a grind. Niko walks slowly but steadily. I notice the man with the camo pack veering onto the Tilly Jane trail and wonder again about him, but I am tired and it is getting late. Left right left. I am very happy to reach the parking lot. 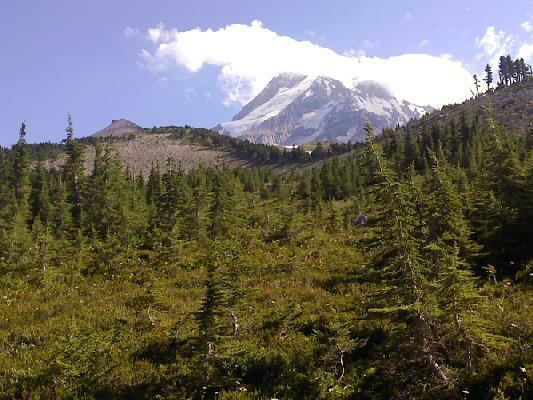 A Cooper Spur hike gains a healthy amount of elevation, and it’s not one to trifle with in poor weather, but it gets the hiker in a real alpine environment with relative ease. If you stop before the ridge crest, you still have great views and you can save an hour, making it much more moderate. 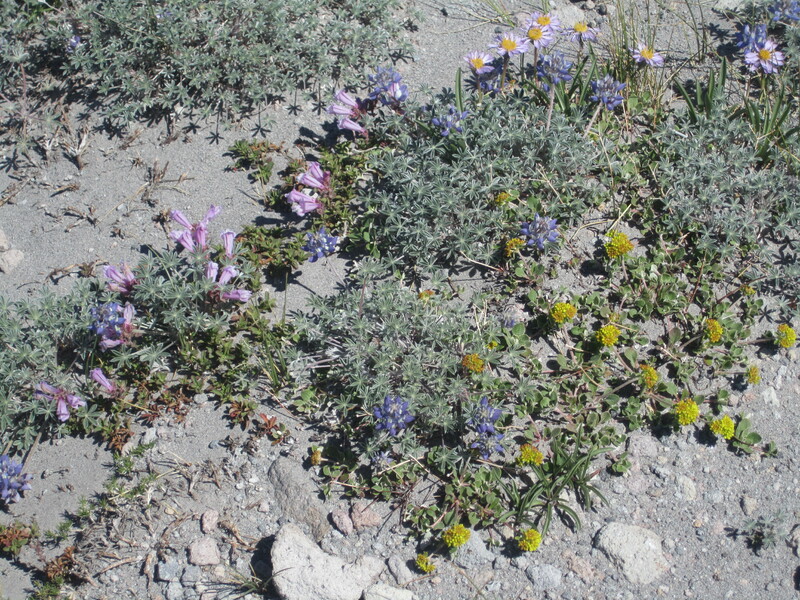 Alpine flowers along the way lend color to the landscape. 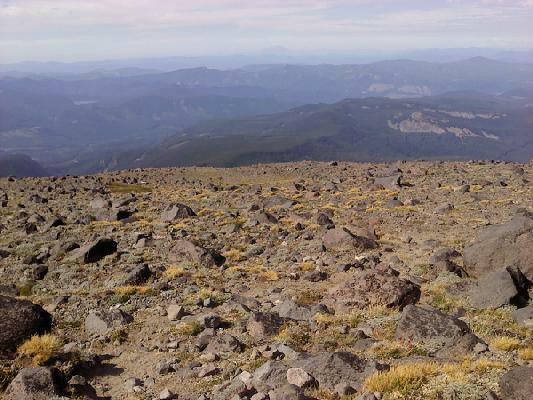 A few days later, an artist friend posts on Facebook about her trip up Cooper Spur. Coincidence? I think not. 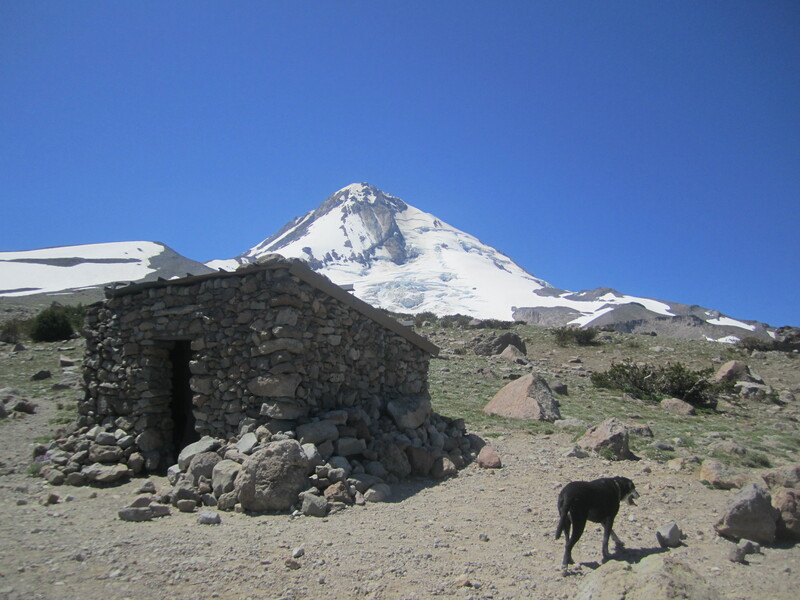 This is a true Oregon classic, a perfect place for exercise and, perhaps, a place for wounded angels to recuperate.